Jill has declared Nice her favorite European city so far because it combines the beach and boardwalk promenade with a "happening" city atmosphere. However, we're not convinced she'd like it so much in high season; the traffic is atrocious even now. We enjoyed the downtown area, its lively streets bustling with shoppers and people at sidewalk cafes. Of course we didn't stay. Determined to make the most of our car, we took it to Cannes. 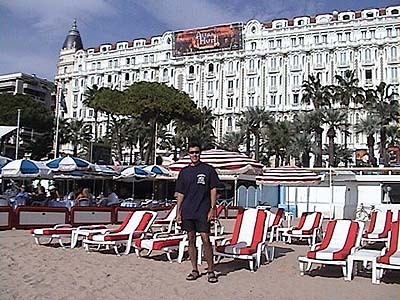 The sandy Cannes beaches are much better than the rocky Nice ones, but Jill still liked Nice more since it seemed less touristy. I must admit that Cannes could be renamed Canned. We didn't see any movie stars, but there was a TV convention in town. Despite our good beach posing we weren't "discovered." Couldn't Baywatch use a semi-fat Chinese lifeguard?